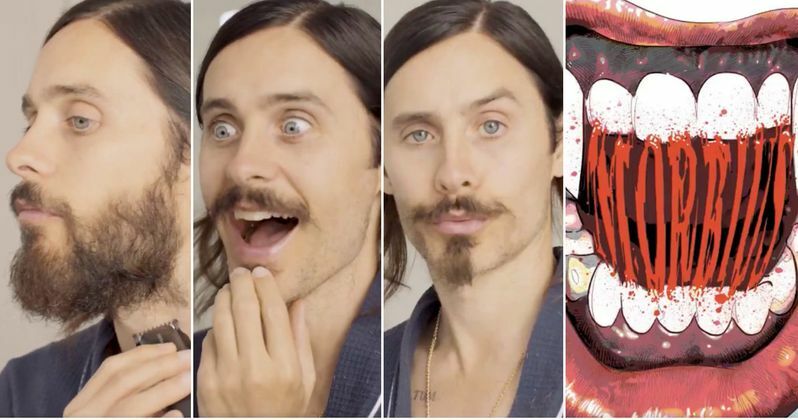 Jared Leto has released a new video on social media, teasing the production start of Morbius the Living Vampire. It was previously believed that production was to start in February of next year, so the actor could be getting ready for some pre-production work like costume fitting and different makeup configurations. After the success of Sony's Venom starring Tom Hardy, the studio is more than likely really excited to start work on another Marvel property with a dedicated actor like Leto leading the charge. In a video post on Twitter, Jared Leto made a small production out of shaving off his beard, which he has had pretty consistently over the years. He hashtagged Morbius, adding "and so it begins," to the caption. The actor takes a beard trimmer, shaving off different portions of his beard to make the video a bit more entertaining, before bringing out the razor to get a close shave. The video ends just as Leto is about to reveal his clean-shaven face. Sony producers /morbius-living-vampire-jared-leto-sony-next-marvel-movie/Avi Arad and Matt Tolmach previously mentioned a production start for the project early next year, but they could be starting sooner than originally thought. Avi Arad and Matt Tolmach both worked on Venom as producers, but they say that there is no rule that is set in stone for Morbius the Living Vampire to be connected to the Venom universe. This is a pretty good way to go about things to avoid a situation like the DCEU. Tolmach had this to say about the placement of Morbius in Sony's Marvel properties. "I don't think there's a rule written somewhere in stone that all of them have to be one thing. I think we've all talked about, Well, if one of these presents itself in a way... Look, we have all seen the R-rated versions of these movies now working. So, that's out there. You can succeed to a staggering degree." While it looks like Sony could be rushing to get the Morbius movie made, that isn't the case. The movie has been in development for a year at the studio. The project is just finally getting to the point where there is actual news to report, instead of speculation. However, we're still in the dark as to what Jared Leto will look like as the titular vampire as well as what the story will focus on. There's plenty of places for the story to go, so it will be interesting to see how it stacks up next to the monstrous success of Venom. Morbius will be directed by Daniel Espinosa from a script by Lost in Space creators Burk Sharpless and Matt Sazama. Things are starting to move forward, so hopefully we get some set images soon. We could end up seeing what Jared Leto looks like in character sooner, if the production follows some of the social media moves that Todd Phillips has pulled off for his Joker movie. Whatever the case may be, production on Morbius is starting soon and you can watch the production tease below, provided by Jared Leto's Twitter account.